Comments: Very Good Condition- May show some limited signs of wear and may have a remainder mark. Pages and dust cover are intact and not marred by notes or highlighting. Among the measures employed to stabilize the strategic relationship between the East and West in the nuclear age, the 1972 Anti-Ballistic Missile (ABM) Treaty is of profound importance. This cooperative agreement to limit offensive and defensive strategic forces has recently been challenged by the allure of new technology, including the proposed Space-based Defense System. Coinciding with the third ABM Treaty Review Conference, this study by an international roster of renowned scholars and policymakers--including two negotiators of the 1972 Treaty--provides insight into the complexities of the issues involved and identifies possible solutions. 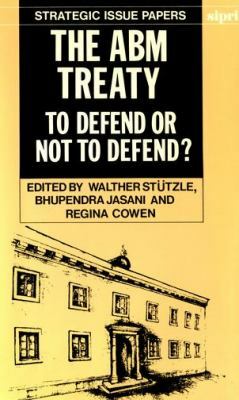 Concise, timely, and well-balanced, this collection is an important contribution to the debates surrounding the future of international peace and security.Stutzle, Walther is the author of 'Abm Treaty To Defend or Not to Defend' with ISBN 9780198291190 and ISBN 0198291191. Loading marketplace prices 7 copies from $3.75 How does the rental process work?